Hitman pays me a visit. I pay him off. My butler Ivan has just reported back, he;d seen a Bigfoot in the back yard! This is bad news indeed. In case you didn’t know, Bigfoot often works with the Illuminati as an assassin for hire, so seeing one in the farm means only one thing. He is here to do me in, in the preferred Bigfoot manner by twisting my head off like a cap on a Bud Lite bottle. 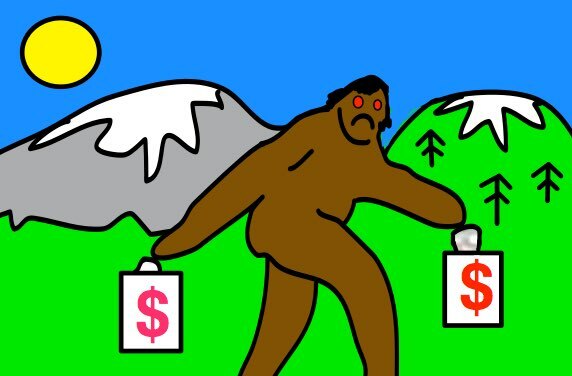 Fortunately I know Bigfoot’s cousin, Mr Yeti, through my days spent in 10K dollars a day rejuvenation clinics run by theosopic monks high in the Himalayas. But the Illumniati must know I’m here so I’m packing my bags (well, Ivan is) and moving on to a safe house. Anyone who offers me shelter will be well rewarded!! Hurry though, Bitcoins value is dropping by the minute!